Entertainment Weekly released the first official photo from the upcoming Dark Shadows movie today and they all look particularly chipper, don't they? 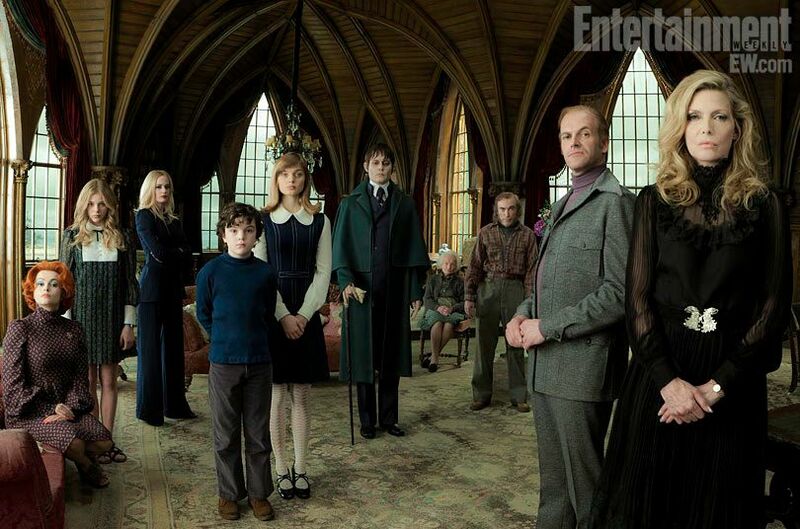 From left to right: Helena Bonham Carter (Dr Julia Hoffman, the psychiatrist...who also needs one), Chloe Moretz (Carolyn, a moody teen), Eva Green (Angelique, a witch who hates this family with a long history with Barnabas the vampire), Gulliver McGrath (David, a troubled boy who believes he sees the dead), Bella Heathcote (Victoria, the new governess), Depp (Barnabas the vampire... ancestor of this family), Ray Shirley (Mrs Johnson, the ancient maid), Jackie Earle Haley (Willie the shady groundskeeper), Jonny Lee Miller (Roger, David's father), and Michelle Pfeiffer (Elizabeth Collins Stoddard, the steely matriarch under seige by witches, family troubles, and the arrival of Barnabas). My biggest question is...when did Michelle Pfeiffer turn into Catherine Deneuve?